+jack wallen of Linux.com posted an article on PDF Chain. This is the first I have heard of it, but I guess it adds a GUI to PDF Toolkit. 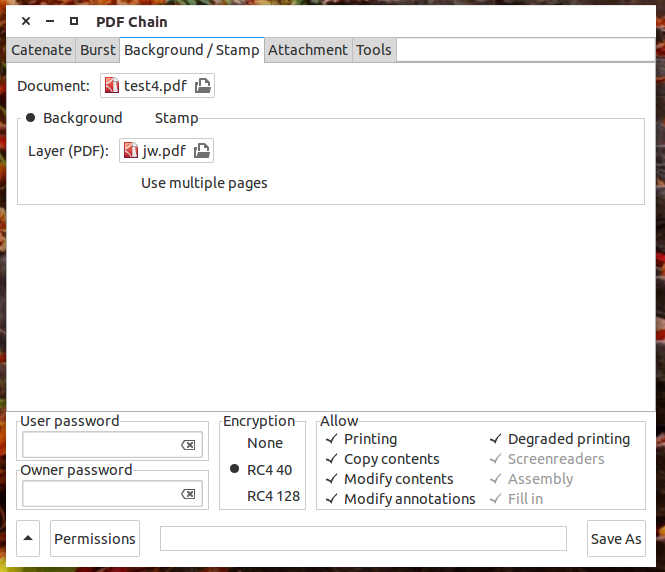 PDF Chain consists of four tabs; catenate, burst, background, attachement, and tools. Catenate allows to to stitch or add several PDF files into one. Burst allows you to take a PDF and burst it into single pages. Background more or less allows you to add a watermark. Attachement is self explanatory and tools adds compression. In the video burst a 20 page PDF, and then stitch three of those pages into a new PDF. I was pretty impressed with this app, although it is not one I would use regularly.